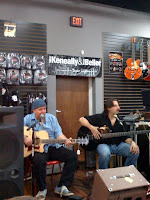 It was a real treat to get the chance to enjoy a small clinic with one of my long-time guitar heros, Mike Keneally. 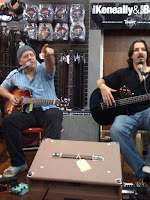 He was accompanied by bass extraordinaire, Bryan Beller. He ran through many of his original instrumentals, many of them played on Taylor acoustics! Some of the pieces were played on the new Talyor solid body electrics. Mike's chops did not disappoint... the man can really play! There was plenty of time to chat and ask questions... and one that has been on my mind for years is: "How on earth did he and Steve Vai play all those whammy bar licks in the "Attitude Song" on the G3 "Live from Denver" DVD without making any mistakes (and jumping and running around, to boot!)?? His answer was: practice. :) He and Steve practiced every lick together with a metronome at super slow speeds and gradually worked them up to tempo. These guys practice just like the rest of us!